Rory McIlroy is hoping to end the year as European number one for a third time. Rory McIlroy and Jordan Spieth are five shots off Branden Grace's lead after day one of the WGC-HSBC Champions. South African Grace's nine-under 63 gave him a one-shot lead over three players in Shanghai, while USA's Dustin Johnson and Patrick Reed and England's Danny Willett are two back. 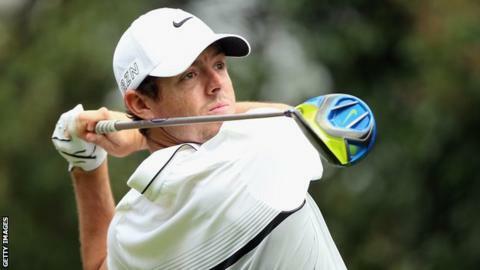 McIlroy played despite struggling this week with food poisoning. "It was probably a little better than I was expecting out there to be honest," the world number three said. "When I was hitting balls this morning on the range I had not been out of bed for basically 48 hours, so I was really stiff," added the 26-year-old Northern Irishman. "I needed to loosen up quite a lot, but when I got out there I felt pretty good. "I've lost 10 pounds since being here. I can't remember the last time I was this light. But hopefully if I have a couple of good meals over the next couple days and rehydrate and I'll be feeling a lot better." Willett, 28, is still hopeful of pipping overall leader McIlroy in the European Tour's Race to Dubai rankings. The Englishman was disappointed to drop his only shot of the day on the ninth - his final hole - but delighted to still be in contention to end the year as European number one. "I've not dropped out of the top two on the Order of Merit all year," said Willett. "I don't think he [McIlroy] is playing next week and if you can be within touching distance going into Dubai, Dubai could be pretty interesting." Masters and US Open champion Spieth will replace the absent Jason Day as world number one with a top-10 finish. The Shanghai event is the second of the season-ending Final Series quartet. The top 60 in the Race to Dubai rankings are then eligible to compete in the DP World Tour Championship in Dubai from 19-22 November.